Circuit breaker problems can make life difficult with a host of harmful effects, but most importantly, they are a safety hazard. Circuit breakers keep you safe from dangerous amounts of electrical current. When they aren’t working properly, there could be a risk of damage to your possessions or even losing your home to a fire. To keep yourself and your family safe, stay on the lookout for the signs of circuit breaker problems. The sooner you identify them, the sooner you can get them taken care of by a professional. When a circuit breaker trips, you should be able to reset it to restore power to the circuit. If you reset it and it trips again, that means there is an unsafe amount of electricity moving through it. In cases like this, the breaker might not be the source of the problem. On the other hand, you might find yourself unable to reset the breaker at all. If the switch doesn’t allow you to click it back into place after moving it to the “off” position, you could have a bad circuit breaker. 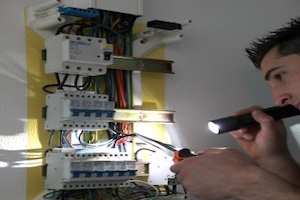 Flickering lights are a nuisance regardless of the cause, but if you notice the problem in specific parts of the house, it could be a circuit breaker issue. This is even more likely the case if the lights blink or flicker when you use certain appliances. A miswired circuit could be at the root of the problem, but don’t make the mistake of thinking a quick fix can solve it. If there is one visible issue, there may be more beneath the surface! A professional can perform a thorough inspection and uncover whatever else might be wrong. If you notice a buzzing noise at the panel, you could be experiencing a connection issue. There could also be an overloaded breaker that hasn’t tripped, which can be a serious problem. If you hear a buzzing sound coming from the breaker panel, do not risk leaving it alone in the hopes of it solving itself. Call in an expert as soon as possible before a more serious problem has the chance to develop. If you are noticing these signs of circuit breaker problems, a professional can help you get back on track quickly and safely. Don’t risk trying to handle the issues on your own. For more information on how to handle circuit breaker problems, get in touch with our friendly team of experts at Bryan Electric today! Visit us online or give us a call at (770) 680-2144 to schedule a visit so your electrical problems can become a thing of the past.